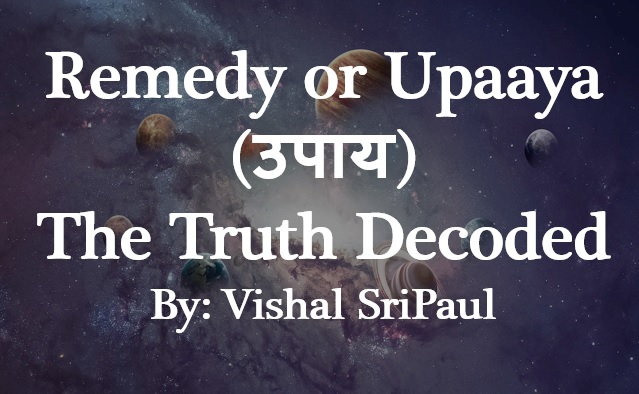 Today, while I am writing on this topic of Remedy & Upaaya, this reminds me of all the misconceptions and myths which today's astrology practitioners has made of this. No doubts that the remedial part of astrology has become a very promising business proposition as I've met many astrologers who left their ongoing jobs and businesses just to be an astrologer for false fame and for making huge money by selling wide range of remedial solutions. Let us firstly look into the word Upaaya. Before that just understand that Sanskrit is a beautiful language which joins to words together to create a new word altogether with a deep meaning and the fact is the words in sanskrit has no comparison to the synonyms in English. If we consider this word Upaaya, then remedy is not synonymous to it as both have different meanings and applications. The term Upaaya has its different meanings in context of different fields. For example, Upaaaya in routine is used as yukti which means "a way", in Ayurveda it is used as "chikitsa" and so on. There are many meanings attached to one word as per its application in different fields of practice. Now, to understand this term which is widely used, we need to go deeper into the meaning of it. The word "Upaaya" is made from two words- "Upa" & "Aya". Upa means "to be near" and Aya means "which is earned". So, the proper meaning of the term Upaaya would interpret to- "to be near to earn something." In the ancient times, when there used to be the Gurukuls and Rishis resided in those Gurukuls, the sincere querent with the guidance of a wise man will head towards a specific direction on a specific date with some offerings along with him (in the forms of flowers, clothes, fruits etc.) will meet the Guru for his questions & doubts. At the end of the discussion, Guru shall give some directions, guidance, instructions and blessings which was called Upaaya. So, Upaaya are the blessings & guidance which is received in close association from a worthy Guru which is the outcome of the sincere seeking of the questioner as well as because Guru's divine duty towards the seeker. But nowadays, Upaaya is replaced with remedies, which interprets to simply the treatment. And, the whole practice in the fields of astrology has gone totally superficial because the querents today are interested in quick solutions to their solutions, which is never possible under any scenario and the astrologers are too interested only in fame & money. That is why we can not hold only astrologers account for this growing con business. 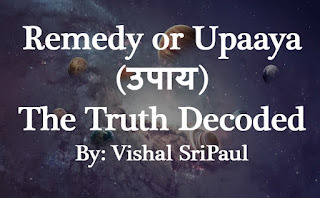 There are several reasons why Upaayas doesn't exist today and one of the main reason is that the majority of astrologers today do not have their own spiritual practices because of which they fall into the strangle trap of fame, lust, conceit, egotism and falsehood. Neither they follow any vedic discipline or ethic nor they recommend it to the people who come to them for solution. Neither they dive deep into the spiritual science to find the truth nor they can lead anyone to that path. Certainly, few sincere practitioners are there too. But when such is the major case, how can the Vedic Jnana (vedic knowldege) be fruitful for the practitioner and for the listener. Vedic discipline simply require each individual to live a natural life in order to live a healthy life and to remain free from any evil effects of the karma. Beloved souls, I'm not writing this out of any heard concept but from my own life experience and working upon thousands of horoscopes, handling various life problems while practicing on the spiritual path under the shelter of my Guru. Astrology is a guiding science to gain guidance when there is darkness of doubts and when one is stumbled into the traps of life situations, then, astrology comes in and sheds light through a worthy Guru. When the practitioners today, they trap you while selling you remedies on the name of religion, they do not only fool you but they fool themselves too. Because, they use knowledge for serving themselves with pride & ego while bluffing with people who come to them with problem and few out of curiosity too. The ones who engage into worshipping ignorance enter into darkness but the ones who engage into worshipping knowledge enter into greater darkness. Now, this simply means those who are using vidya for the same of puffing up their ego & pride, they fall into greater darkness than the ones who are in ignorance. The remedies which the astrologers refer are merely out of what they read through books or learn from the ongoing practices around. Because, the fact which I'm very sure of is- if any astrologer would have his own spiritual discipline, 1.) he will need no book to read but the nature itself will reveal unto him, 2.) he himself will attain the ultimate truth with the help of this vedic science and will help others too, 3.) his words uttered from his mouth will manifest and his blessing will be an Upaaya, 4.) he himself will be safeguarded by nature and thence, will be the ones associated with him. 1.) Do not visit anyone blind-folded, just for the sake of getting a quick solution because there aren't any. 2.) If the astrologer himself has no spiritual discipline, do not visit him. Although, it's difficult to check but with so much of social media around, you can very well see whether the astrologer follows a vedic lifestyle or merely an eye wash. 3.) If the astrologer offers to sell you the expensive remedies and that too on the name of any dosha in your horoscope, just run away from there. Remember that the gruhas or the divine force has no enmity with you. Life is just a play of human experiences coming through life situations and to be experienced through various emotions. And, none other than you or your Guru can help you hail through any situations. Do you think there is any remedy to death? If no, then what is left before death is a life to live and experience than becoming handicapped by dwelling upon any remedy. 7. when you wake up, handover you day and when you sleep, submit your day to your Guru or Lord. If you follow this and believe in the divine force, you will always be hailed through the most difficult of the storms. I pray that May divine be your guiding light and be your saviour.